The research around visual search is gaining relevance due to the evolution in the generation and usage of digital images. A signifi cant push comes from the mobile visual search topic, due to the widespread proliferation of camera enabled mobile devices. The new scenarios are increasing the urgency of novel solutions for challenging problems such as the effi cient coding of compact visual descriptors and the interoperability of distributed visual search query interfaces. Currently, almost every visual search service off ers a different retrieval interface and image metadata description format, preventing unified and effi cient access. In this context, standardization groups such as ISO/IEC SC29/WG11 (MPEG) and ISO/IEC SC29/WG1 (JPEG) have been working to create uni fied interfaces for image repositories. In one hand, MPEG provides the ISO/IEC 15938-12 (MPEG Query Format, MPQF), which standardizes a query language for multimedia repositories and has also started an activity for standardizing compact descriptors for visual search (CDVS). On the other hand, JPEG is now finishing the ISO/IEC 24800 (JPSearch), which provides solutions to the image metadata interoperability problem. This paper analyzes how these standardization activities can be combined to satisfy the requirements posed by the mobile visual search scenario, which are their limitations and which are the necessary actions to be taken by the standardization committees in order to overcome them. Tous, R.; Delgado, J. 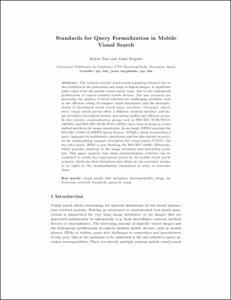 Standards for query formalization in mobile visual search. A: International ICST Mobile Multimedia Communications Conference. "Proceedings of the 7th International ICST Mobile Multimedia Communications Conference". Cagliari: 2011.